WASHINGTON (Reuters) - U.S. home sales tumbled to their lowest level in three years in December and house price increases slowed sharply, suggesting a further loss of momentum in the housing market. The weak report from the National Association of Realtors (NAR) on Tuesday was the latest indication of slowing economic growth. A survey last Friday showed consumer sentiment dropped in January to its lowest level since President Donald Trump was elected more than two years ago. Existing home sales were now the weakest since Trump was elected, said MUFG Chief Economist Chris Rupkey, "signaling the initial confidence boost from the new ideas and new legislation is falling flat." The NAR said existing home sales declined 6.4 percent to a seasonally adjusted annual rate of 4.99 million units last month. That was the lowest level since November 2015. Wage growth topped 3.2 percent in December, outpacing house price gains for the first time since February 2012, according to the NAR. While economists expect affordability to improve, they also caution that changes to the tax code in December 2017, which limited deductions for mortgage interest and property taxes, had reduced the appeal of homeownership. Stocks on Wall Street were trading lower amid fears of slowing global economic growth after the International Monetary Fund trimmed its outlook. The dollar was little changed against a basket of currencies and U.S. Treasury prices rose. A survey last week showed a rebound in homebuilders' confidence in January amid hope that the moderation in mortgage rates "will help the housing market continue to grow at a modest clip as we enter the new year." A month-long partial shutdown of the federal government, which has delayed data from the Commerce Department is, however, obscuring the economic picture. The shutdown started on Dec. 22 as Trump demanded that Congress give him $5.7 billion this year to help build a wall on the country's border with Mexico. It has affected the Commerce Department, leading to the suspension of the publication of data compiled by its Bureau of Economic Analysis and Census Bureau, including new home sales, housing starts and building permits. Data released before the shutdown had pointed to persistent weakness in the housing market, with economists estimating that housing would again be a drag on gross domestic product in the fourth quarter. Residential construction has subtracted from GDP growth since the first quarter of 2018. Economists estimate that the impasse over the border wall was cutting off at least two-tenths of a percentage point from quarterly GDP growth a week. The Realtors group said the longest government shutdown in the country's history had so far not had an impact on home sales, but warned this could change. At December's sales pace, it would take 3.7 months to exhaust the current inventory, down from 3.9 in November and up from 3.2 a year ago. A six-to-seven-months supply is viewed as a healthy balance between supply and demand. Houses for sale typically stayed on the market for 46 days in December, up from 42 days in November and 40 days a year ago. Thirty-nine percent of homes sold in December were on the market for less than a month. 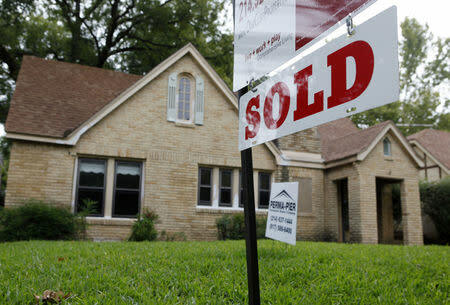 The share of first-time buyers fell to 32 percent last month from 33 percent in November. Economists and realtors say a 40 percent share of first-time buyers is needed for a robust housing market. "Going forward, we expect softer home prices to support existing home sales, but not by enough to offset the downtrend," said Roiana Reid, an economist at Berenberg Capital Markets in New York. "The only sustainable and viable solution in our view is more construction, especially of lower-priced homes."